Just to point out how prolific he was, here's a list of some of the characters and creations attributed to Jack Kirby. It's mostly taken from these two lists, plus a handful of additions I noticed weren't in either. 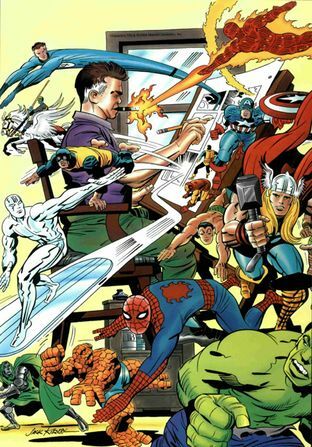 I'm confident this is nowhere near complete -- it doesn't even take into account characters he created for animation studios -- that's how awesome Jack Kirby was. Wow, I knew he created a lot of characters, but seeing this list makes his accomplishments even more awe-inspiring. There were gaggles of useful, fun, interesting, sturdy, and powerful concepts in the King.